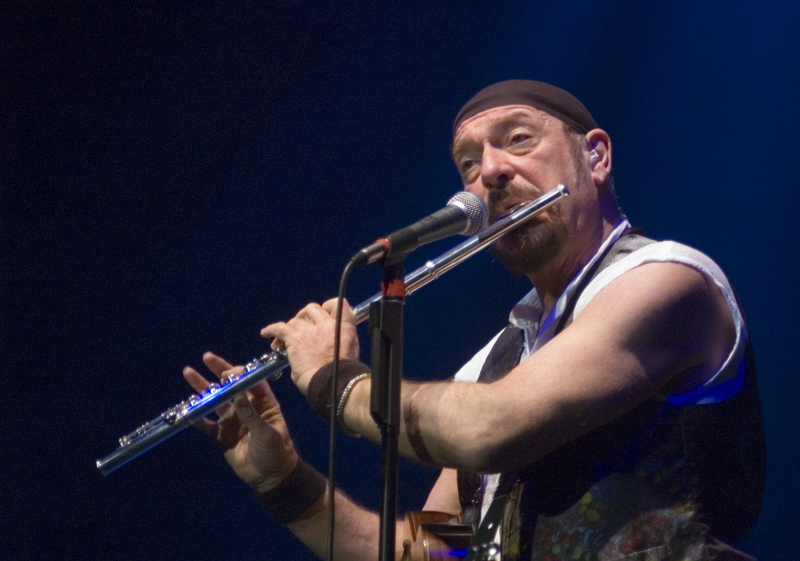 On April 3, Jethro Tull’s Ian Anderson will release Thick As A Brick 2, the followup to 1972’s beloved prog opus Thick As A Brick (an album comprised of two long, interconnected songs). In this extensive interview, rock’s most famous flautist talks to American Songwriter about the sequel’s genesis, its parallels to the original, his distinctive vocal style, and whether or not he believes he can win another Grammy. With the recent Aqualung reissue and now Thick As A Brick 2, this a pretty exciting time to be a Jethro Tull fan. It’s a really exciting time for me too. Aqualung and Thick As A Brick are two of my favorite records for the simple reason that from an artistic and a personal songwriting point of view, they’re very different in terms of their musical and lyrical content. They both represent a period when I got brave enough to take a few risks with different topics, different subjects, and different ways of writing music. So the two albums are very dear to me in sort of artistic sense. I have studiously avoided, over the years, to recreate Thick As A Brick, either in terms of playing it all on stage, or venturing down that slightly more prog-rock course of musical endeavor. And I was pretty much maintaining that position until sometime late in 2010, when I met up with an old acquaintance by the name of Derek Shulman. He used to be the singer of the band Gentle Giant, a prog-rock band that had quite a bit of success in the late ’70s. He then went on to be a successful record producer in the USA, signing bands like Nickelback and others. When I met him, he strongly suggested his idea of doing a sequel to Thick As A Brick, which I reacted to with my usual disdain and negative thoughts, but we had another conversation probably later on that year. Somehow the idea just popped up in a conversation about, “I wonder what the eight-year-old Gerald Bostock [Thick As A Brick‘s fictional protagonist] would be doing today. Would the fabled newspaper [seen in the album art] still exist? It was the thought of bringing that idea into the current context. First of all, how do our lives develop? What chance encounters, what interventions shape our lives? It’s what we go through from childhood onwards. That, in itself, began to pose some interesting parallels with my own thinking about my own background, my development in school, my early career, my choice of doing things along the way. So it suddenly coalesced, in a period of hours rather than days, into a full-blown concept for writing a new album. Once I had that, the whole picture changed. I thought, “I think I can do this.” I just kept it in the back of my mind until the end of January last year and started to try to evolve it as more of a detailed picture – just laying out the bones of it on a piece of paper. Then I started writing some lyrics and I already had one or two pieces of music by then that I thought I could bring into play and so I just kind of got on with it. Within about two weeks, I had the album pretty much done in the sense of the lyrics and the music. I went off to Munich and spent the day with my guitar player friend. We made some demos of the whole thing in a few hours. Then I came back and spent another day in the studio home of our keyboard player and we started to work on the scores of that. We put it all into the software program called Sibelius, created a huge musical score of the whole album which was given out to the other band members in March last year. Then we went on the road for six months and didn’t give it too much thought, other than we played two or three of the songs live on stage to try them out. The lyrics were changed a little bit and titles and things to avoid giving the game away to the public. We then went back to it at the end of November. We finished the Scandinavian tour, came back, took a few days off, and then convened for rehearsals. We did about a week or so of rehearsal and ten days in the studio and then a few days of mixing. We finished my part of it all right about the 3rd or 4th of December. Then we spent a few days working with Stephen Wilson, the man behind the band Porcupine Tree who remixed the Aqualung album last year and he remixed the Thick As A Brick album too, ready for release, or re-release later this year. It was all wrapped up and done well before Christmas. That’s the story. How does that compare to the amount of time it took you to come up with the music and lyrics for the original album? It’s all identical. I think the only difference is that with Thick As A Brick 2, I wrote it all and then there was a period of six months before we recorded it. With Thick As A Brick 1, I was kind of writing it and rehearsing it pretty much on the same day. I would write the music in the morning, go to the rehearsal room in the afternoon, work with the guys into the evening, and then we did that every day for about ten days. Then we went and recorded it in Morgan Studios in London in a period of about ten days. We spent a few days mixing it and that was done. It was pretty much the same amount of intense work that’s involved in this one. So yeah, remarkable similarities really, in terms of the band being in the studio working together playing it together almost like a live experience. It was extensively all-together, not fragmented because it’s a big piece of music with a lot of joins, sections, reiterations, developments, and utilizing themes that crop up a few times in different ways on the album. It was the kind of work that, as musicians, you can get your teeth into. You can sort of tackle it in a bigger way. You’re not just learning a four-minute song. It’s 50 odd minutes of music. It was quite an intense time for all the musicians just as it was back in 1972. Just like in 1972, I think a lot more time was spent doing the artwork, marketing, and promotional blends. The newspaper is now online. It’s a community Internet magazine really for the imaginary small town communities. So are all the songs connected? Are there breaks in between on the new record? Well, there are ID points. I wrote the music very much for the idea that there could be ID points where you were able to listen to it in separate pieces, so in this day in age of iTunes and digital retailers, you can find it. So there are ID points. I don’t really like to call them songs or tracks but I decided I would treat it kind of like songs. But in reality, things repeat and develop so it’s not really a collection of songs. It is more of a continuous flow piece of music. One thing leads to another. But you can group areas into certain subjects and topics, where two or three pieces kind of hold together on the same idea for a while. I don’t really like to talk about them being songs or tracks, but I recognize the fact that other people do. I kind of constructed it in order to put these ID points on so when you hit the forward button on your player or computer or CD player or iPod, you can at least go forward or backward to the section that you want to hear. Of course, you can buy them on iTunes as separate pieces – you don’t have to buy the whole album. That would be kind of ridiculous though. Tell that to Pink Floyd. They somewhat famously recently refused to let Dark Side Of The Moon be unbundled for iTunes and said it could only be sold as a full piece. You have to buy the whole album or nothing at all. It seems to me not realistic. I think if you go and look at the majority of great classical works, you’ll find them unbundled in one form or another on iTunes or another provider. So I don’t see why we shouldn’t be doing that now with contemporary pop music, even if it is a bigger work. I think you’ve got to make it accessible, practically speaking, to people who listen to it in terms of today’s equipment. I mean anything is better than the awful noisy empty grooves between tracks – lifting the needle and trying to find the track again, only to hear those awful noises and realize you’ve just taken another 20 plays off the life of your vinyl record by dropping the needle in the wrong place, or too clumsily. So we should be grateful for the digital age. The original Thick As A Brick was meant as a parody of prog-rock, right? It remains as a parody of the concept prog-rock album of its day. Because at that point, there were several bands producing rather elaborate and sometimes pompous, overblown productions of music, which were sometimes a mixture of great ideas and too much showing off. Those were bands like Yes and King Crimson and the early Genesis. it wasn’t my favorite kind of music, but I enjoyed quite a lot of it. They were great musicians and did some great stuff, but it just seemed a convenient time to create a bit of a spoof of that grandiose concept album. So I wrote something that was designed to be just that, from the starting premise of an 8-year-old boy writing this piece of rather impenetrable and surreal poetry. I mean if you buy into that, then you buy into the whole thing. I thought the joke was kind of obvious, but I guess for a lot of people it wasn’t so obvious. If it was, they didn’t really care. They just liked the idea of it anyways. So it didn’t really have to be explained unduly and in some countries, I suppose people still think of Thick As A Brick as being literally what it says on the packaging. But that was always going to happen to some little degree. I would imagine most people understand that it is a spoof. It’s a fabricated and observed notion. But the follow up album is based on an extrapolation of that idea, not just Gerald Bostock but anyone – you know, what happens to you in life. It’s perhaps a rather more somber and serious, sometimes more dark, follow up to the original Thick As A Brick. It is what you expect 40 years down the line. It’s a grown-up piece of work. It has some dark and unhappy moments in there. It’s not all fun and games. Online at StCleve.com, it’s more lighthearted and definitely the spoof every bit as it was back then of parochial country life. In fact, I will be inviting our fans to participate in a couple weeks time of writing their own stories for StCleve.com as correspondents We’re going to let some people appear online and they can write their own stories. We’ll pick a few of those each week and put them on our website to join in the fantasy of parochial country life in England. We’ll have to edit out the bad words and inappropriate photographs. We have to remember our responsibilities and we won’t let it overstep the mark of tastefulness.